that is unknown. If the Variables in the edit boxes are not correct, the “not balanced” sign will appear. 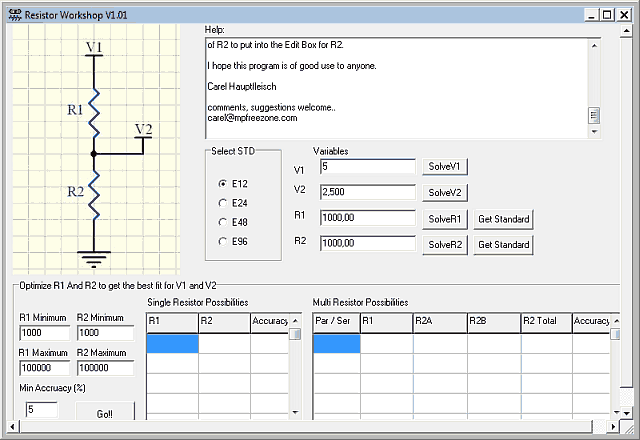 balanced when the shown values of R1 and R2 will result in V2 if V1 is applied to the divider. At any time, one can press a “Get Standard” button to get the closest corresponding standard value. choose between the different E-ranges of resistor available. resistors to make up a value for R2. Both parallel and series combinations are calculated. of R2 to put into the Edit Box for R2.